At Abbey Road, West Bridgford, Nottingham, Robert Woodhead Ltd completed a new build achieving a 36.5 Considerate Constructor’s score in its final assessment, putting the new build project in the top 2.5% of Considerate Constructors schemes in the country*. The success of the project has led to site manager, Bob Chadwick receiving the Considerate Constructors Bronze Award at the National Site Awards. Photo: Bob Chadwick, Site Manager for Robert Woodhead at Abbey RoadPrimary School receiving the Bronze Award. Securing the £400,000 project by Robert Woodhead was for Nottinghamshire County Council and involved a new build of a children’s centre on the Abbey Road primary school site using TEK structural insulated panels (SIPs) designed, supplied for optimum insulation, air tightness and reduced of on site waste and construction time. All supervisors recently undertook NVQ Level 3 training courses in construction site supervision. * 31/40 is the national average score and 24/40 is the benchmark for compliance. 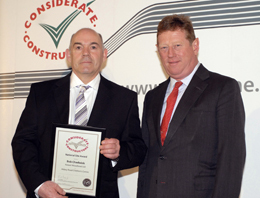 The Considerate Constructors scheme is a non-profit making independent organisation founded by the construction industry to improve its image.